One might suspect from the unusual title that this is not your usual fare. Indeed, Albert Marcœur is not your run-of-the-mill progressive rock musician, and while this writer can’t claim to have heard either of his two most recent releases (1990’s Ma Vie avec Elles and the more recent Sports et Percussions from ‘94), his first four albums dating from the mid 70s through the early 80s (all four were once available in one 2CD package, but are now out of print) are absolutely essential monuments of originality and pure genius, full of brilliant and eccentric arrangements, using taped sounds as part of the percussive vocabulary, along with drums, sax, flute, guitars, bass, piano etc. and plenty of very bizarre, almost spoken French vocals — many have called him France’s answer to Frank Zappa, and at times this writer would have to agree; Marcœur has much of the same collected compositional focus, a master of many instruments, though unlike Zappa’s jazzier preferences, Marcœur seems to have more elements of Euro-traditional musics woven into his vision, as well as some genuine 60s pop eccentricities a la Sgt Pepper / Magical Mystery Tour era Beatles. 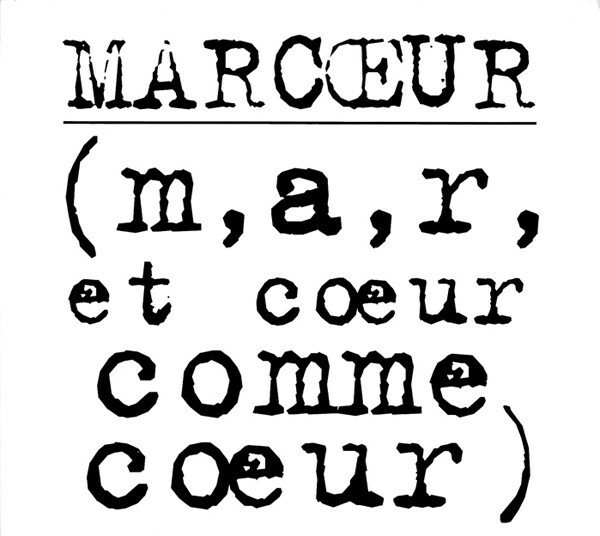 Fast forward to the late 90s, and Marcœur’s eclectic vision is still intact and as unpredictable as ever, though one will immediately notice that the twelve songs herein were written and recorded over a period of 14 years. Leftovers from the 80s and early 90s? Given the exceptional quality of this material one certainly wouldn’t think so. At any rate, this should offer the longtime listener and newcomer alike an excellent cross-section of Marcœur’s highly original work: as good a place to start as any, or a fine point to get reacquainted. Along with a booklet full of French lyrics to follow along with, it comes with a CD ROM track that has yet to function in this writer’s NT4.0 based computer, although Macintosh users have reported better results. Highly Recommended.